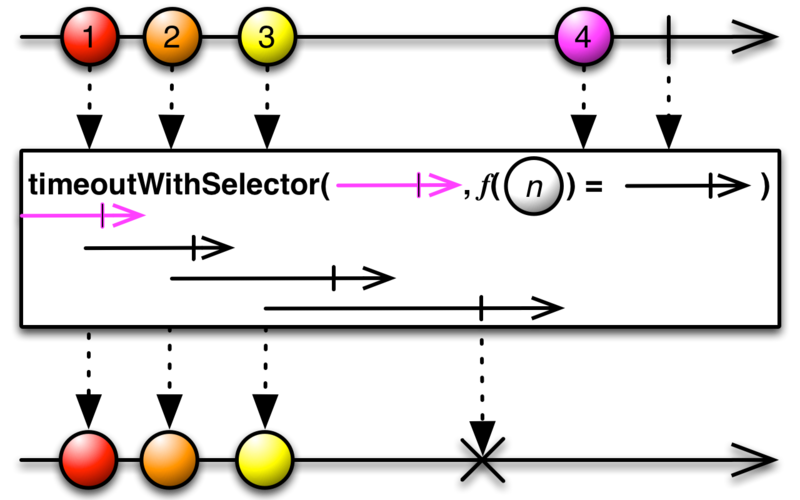 The Timeout operator allows you to abort an Observable with an onError termination if that Observable fails to emit any items during a specified span of time. RxGroovy implements this operator as timeout, but in several variants. 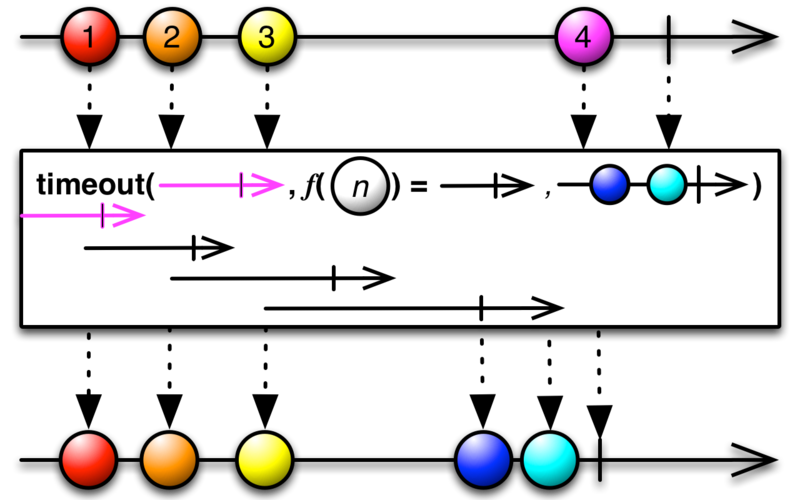 The first variant accepts parameters that define a duration of time (a quantity of time, and a TimeUnit that this quantity is denominated in). Each time the source Observable emits an item, timeout starts a timer, and if that timer exceeds the duration before the source Observable emits another item, timeout terminates its Observable with an error (TimeoutException). A second variant of timeout differs from the first in that instead of issuing an error notification in case of a timeout condition, it instead immediately switches to a backup Observable that you specify. A third variant of timeout does not use a constant timeout duration, but sets its timeout duration on a per-item basis by passing each item from the source Observable into a function that returns an Observable and then monitoring those Observables. 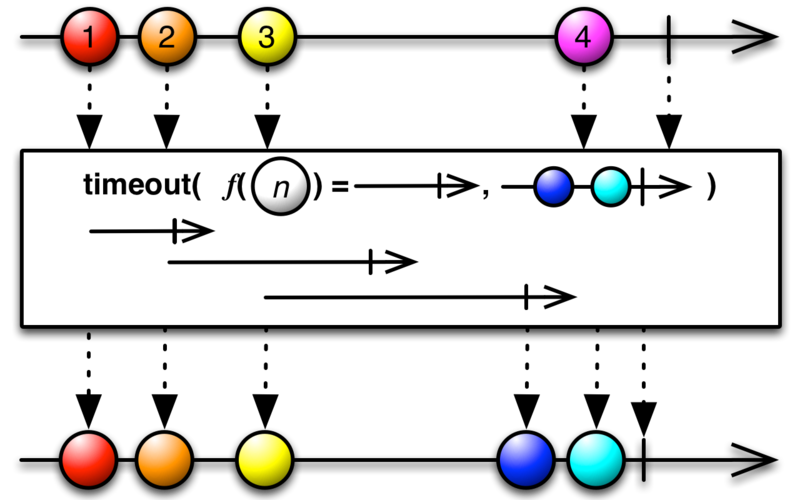 If any such Observable completes before the source Observable emits another item, this is considered a timeout condition, and triggers an onError notification (“TimeoutException”) from the Observable timeout returns. This variant of timeout by default runs on the immediate Scheduler. There is also a variant of timeout that both uses a per-item Observable to set the timeout duration and switches to a backup Observable in case of a timeout. 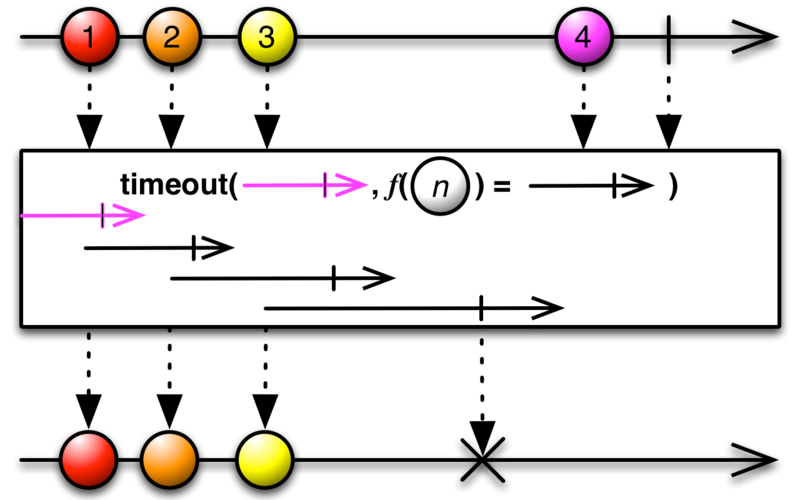 The variant of timeout that uses a per-item Observable to set the timeout has a variant that allows you to pass in a function that returns an Observable that acts as a timeout timer for the very first item emitted by the source Observable (in the absence of this, there would be no timeout for the first item). And that variant also has a cousin that will switch to a specified backup Observable rather than emitting an error upon hitting a timeout condition. RxJava implements this operator as timeout, but in several variants. By default this variant of timeout operates on the computation Scheduler, but you can choose a different Scheduler by passing it in as an optional third parameter to timeout. 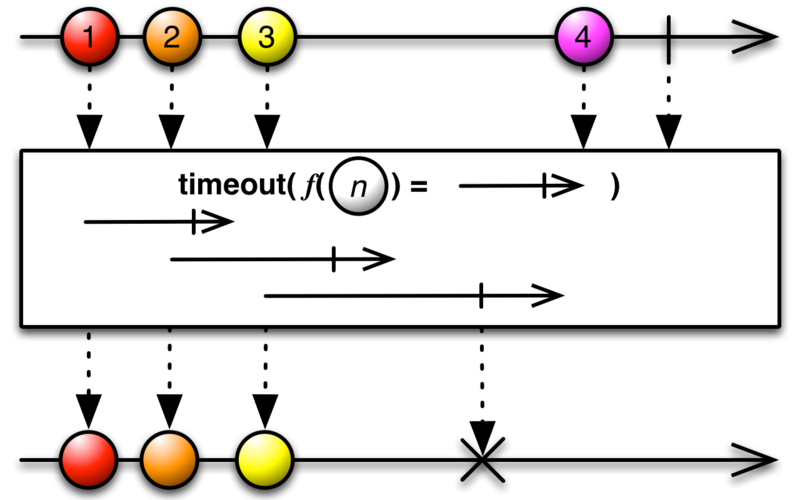 One variant of timeout accepts a duration of time (in milliseconds). Each time the source Observable emits an item, timeout starts a timer, and if that timer exceeds the duration before the source Observable emits another item, timeout terminates its Observable with an error (“Timeout” or a string of your choice that you pass as an optional second parameter). Another variant allows you to instruct timeout to switch to a backup Observable that you specify, rather than terminating with an error, if the timeout condition is triggered. To use this variant, pass the backup Observable (or Promise) as the second parameter to timeout. 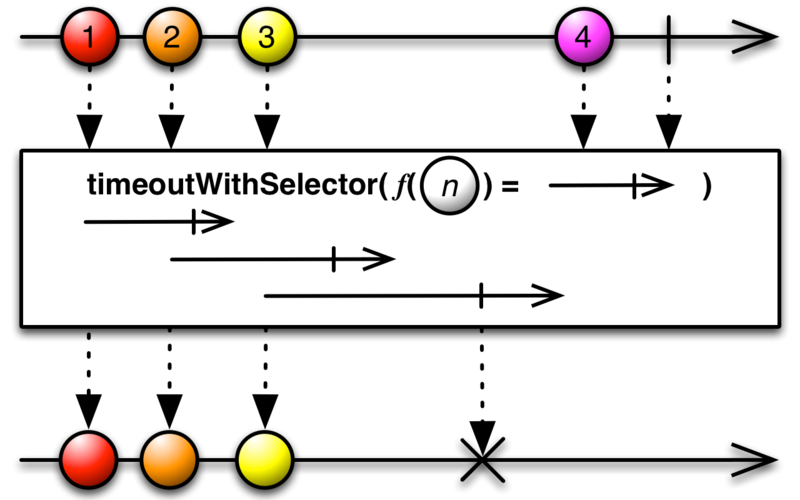 timeoutWithSelector does not use a constant timeout duration, but sets its timeout duration on a per-item basis by passing each item from the source Observable into a function that returns an Observable and then monitoring those Observables. 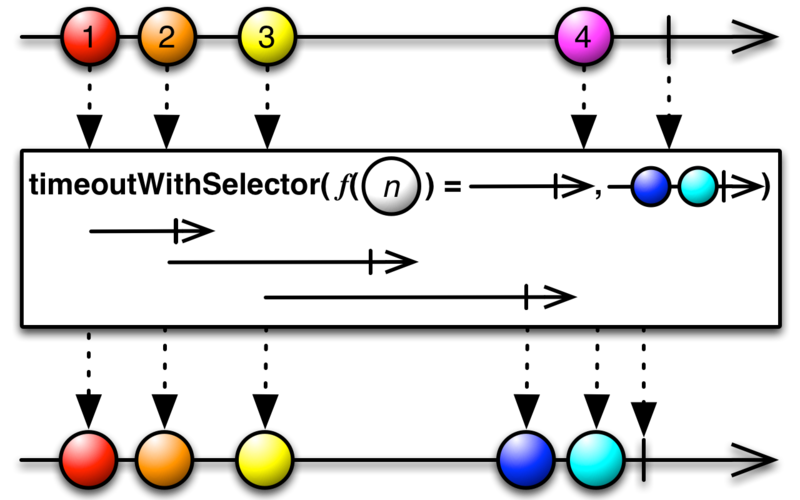 If any such Observable completes before the source Observable emits another item, this is considered a timeout condition, and triggers an onError notification (“Error: Timeout”) from the Observable timeoutWithSelector returns. There is also a variant of timeoutWithSelector that both uses a per-item Observable to set the timeout duration and switches to a backup Observable in case of a timeout. 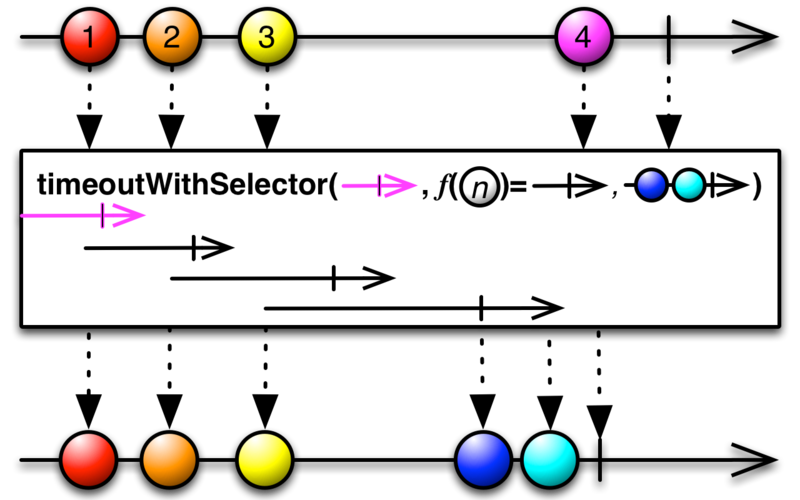 The variant of timeoutWithSelector that uses a per-item Observable to set the timeout has a variant that allows you to pass in an Observable that acts as a timeout timer for the very first item emitted by the source Observable (in the absence of this, there would be no timeout for the first item; that is to say, the default Observable that governs this first timeout period is Rx.Observable.never()). RxPHP implements this operator as timeout.